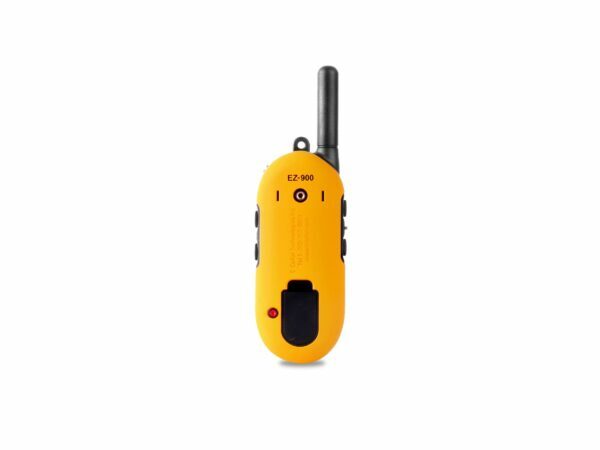 The EZ-900 Easy Educator is a modern remote trainer-designed with safety in mind, novel features like maximum stimulation setting and lock and set provide safety from accidental over stimulation of the dog. This medium range trainer is loaded with unique features making it the most humane and effective trainer available. 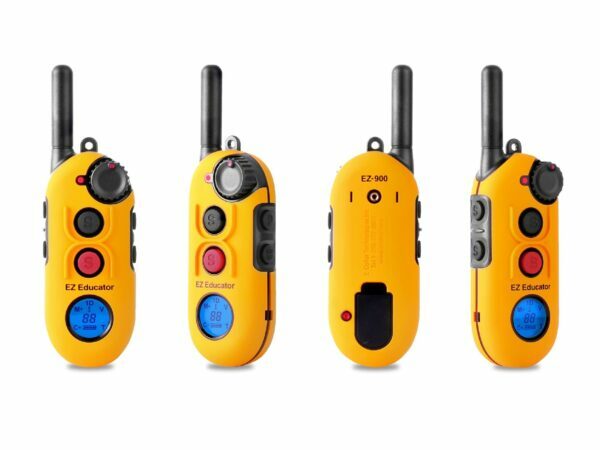 The bar shaped transmitter is especially well-suited for easy operation and is small providing stealth operation when the situation requires discreetness. don’t be fooled by the small receiver size 6cmX4cmX3cm 68 Grams, it provides plenty of stimulation for most dogs even normal temperament 68KG dogs respond to our blunt stimulation. The unique COS (control of stimulation) technology provides very clean stimulation without the normal head jerking often found with other training collars. The boost feature is available to provide boosted stimulation from 1 to 60. The tapping sensation employed is similar to vibration, but more intense making it a good substitute to the stimulation. 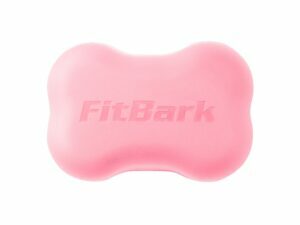 The ergonomic design of the remote allows the user to watch your dog. 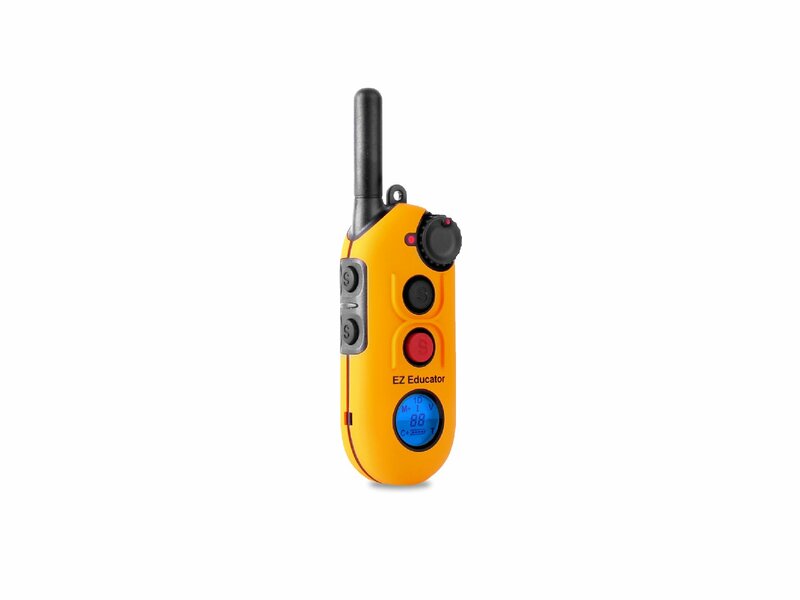 The night tracking light is controlled by the transmitter allowing the user to flash or continuously light up the collar receiver for locating your dog after dark. 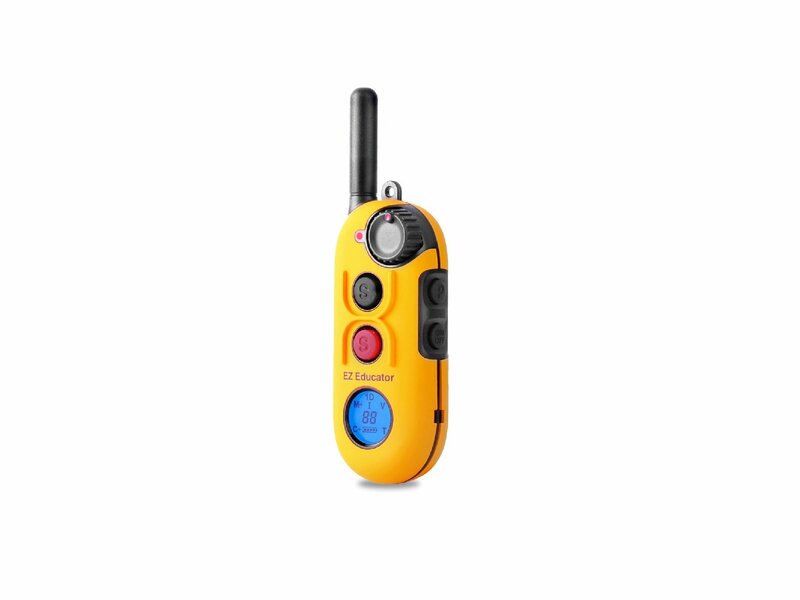 Lost transmitter beeper can be turned on to help locate a misplaced or lost transmitter. 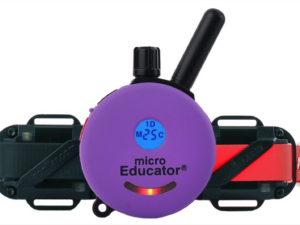 The Easy Educator will turn a smart stubborn dog into a genius. 100% Satisfaction Guaranteed. Proudly Assembled in the USA. What Makes Us Different: E-Collar Technologies has been helping owners train their dogs of all temperaments and obedience levels. Learn more about how our e-collars are made and how you can use them to improve your relationship with your dog! 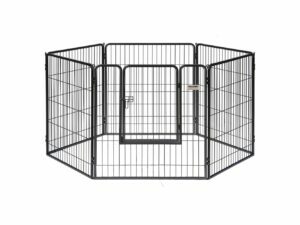 This is one of three e-collars I have purchased to train my pit bull and the best investment I have made. The first collar only worked half the time, the second one fell apart but this collar never fails. I don’t even have to use the stimulation now, just vibrate or the beep when he doesn’t listen to commands. It is intimidating at first because of all the buttons. I worked with it for three days before even putting it on my dog. It fits comfortably and stays in place. These collars have saved my dogs life since he is a runner, stubborn and has a high pain tolerance. Anybody who thinks they are cruel, doesn’t know how to use one properly and I always recommend a consultation with a trainer. This dog was on a chain for two years, no socialization and had aggression issues but the changes in him in the past few months have been amazing. 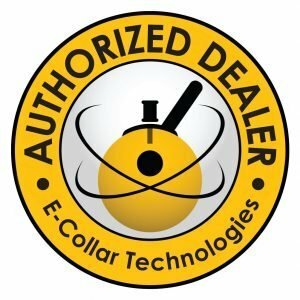 If you are considering purchasing a “shock” collar, don’t! Instead, I highly recommend that you purchase this “e-collar”. 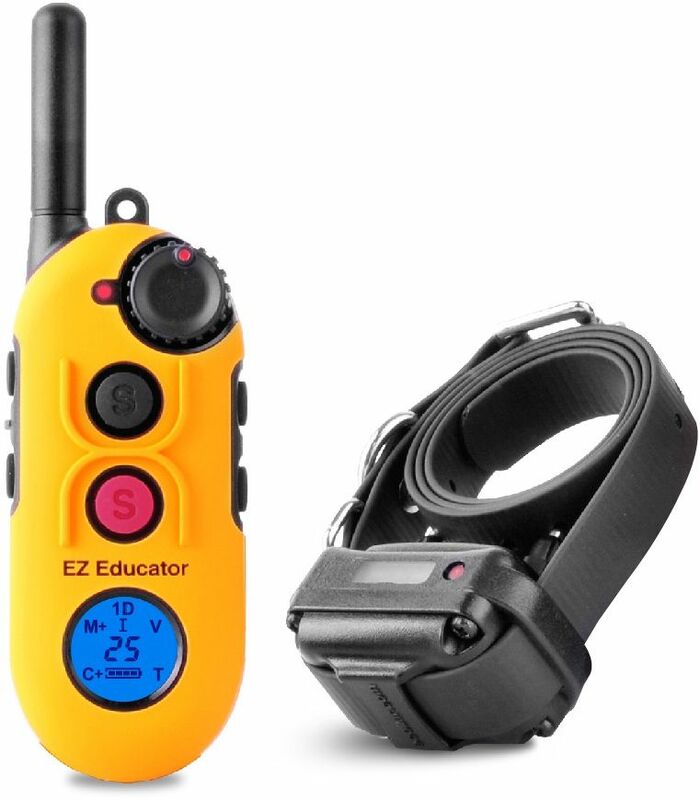 After debating with myself about whether I needed this high-end device instead of the typical $50-$75 collar, I am so glad that I selected the EZ Educator! I’ve spent the first 3 years of my dogs life working with him on commands and obedience. That really is half the battle. He just needed that little extra reinforcement, especially in high distraction situations when his excitement/adrenaline would cause him to have momentary lapses in judgement. Now, my dog was probably ready to go off leash much sooner. But, as a precaution, I continued to work with him until I was confident that he would be okay. At this point, I still walk him with a leash downtown (i.e. high traffic areas). Again, know your dog. For me, it’s just more responsble to have your dog on a leash when in the city. After I purchased this item, I held it up to my own neck and slowly stepped up the strength of the signal. I wanted to understand what the dog might be experiencing. I went through levels that caused mild annoyance to great discomfort. 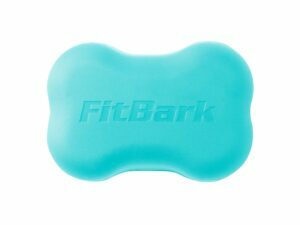 That is the beauty of this device … it allows you work at very low levels throughout your dogs training sessions. You should not be constantly blasting your dog! Especially if he’s just learning the commands. I personally love this product! I’m so happy that I purchased it. My dog now obeys my commands without the need for constant correction with the collar. It was worth every penny!!! Best training collar we have ever owned, and we’ve owned a lot! Excellent customer support too! Disclaimer: The collar does not train the dog. The dog owner trains the dog. It takes consistency and patience. This collar is merely a tool to be able to reach out to your dog whether he is right next to you or 100 feet (1/2 mile) away. The product works great, but the instructions for use are poor. A trainer set them up for me, and I went on YouTube for clarification. Once they are programmed, it’s good to go. I use one controller for 2 dogs.